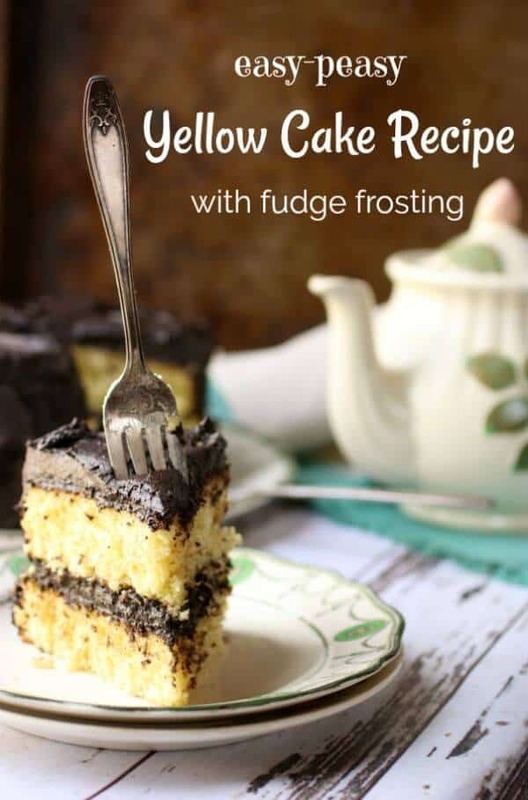 This easy yellow cake recipe has a fudgy, bittersweet chocolate frosting and filling. It’s moist and buttery – just like the classic layer cake you remember from your childhood! Plus I’ve included tips and tricks to make sure that your homemade yellow cake comes out perfect every single time. There’s not a better cake for birthdays and other celebrations. If you’ve been making it from a box get ready for this recipe to change your life! This post and images have been updated from the original September 2007 version for a better reader experience. A good, classic yellow cake recipe is one of those things that everyone needs to have in their recipe box. It is as welcome at a fancy party as it is on a child’s birthday table. There is something comforting about yellow cake. I ‘m not sure exactly what does it for me, the cheerful golden color, the delicate taste? It goes with everything, it is easy to make, and nearly everyone loves it. Add a deep, rich chocolate frosting and you have everything childhood memories are made of on a plate. My mother was not much of a cook. She just didn’t take any enjoyment in it. However my best friend lived across the street in the midst of a large, boisterous family. I was enchanted by the activity in that house – the smells that wafted from the kitchen, the freedom they had to do crafts in the den, or to bake cookies or whatever. I was not allowed in the kitchen at my house for fear I would make a mess. Amazing things appeared in that kitchen across the street, things that I had never imagined existed. Cream puffs, eclairs, marble cakes, and cookies to dip in large glasses of cold milk were displayed in all their glory on tables and countertops. One day when I was about six I mentioned that I felt bad because it was my mother’s birthday and I was not allowed to mess up the kitchen. She had not had a cake for her birthday that I could recall and I really wanted her to have one. Mrs Willett, (that was the name of this wonderful woman, and yes, if you are a Willett from Warrington, Pa. I am talking about you) immediately offered the use of her kitchen, her supervision, and allowed my friend, Chris, and I to create a cake for my mom’s birthday. Now that I have 8 kids myself I understand the time sacrifice that loving act was. I learned that I loved cooking that day and I learned that some things were much more important than a clean kitchen. It’s a lesson I brought into my adulthood and into my own house. I’ve been woken up by the aroma of cake or cookies baking in the middle of the night numerous times and came downstairs to see a couple of my kids and their friends baking at 3 AM. As long as they clean up after themselves and don’t burn the house down I’m good, you know? 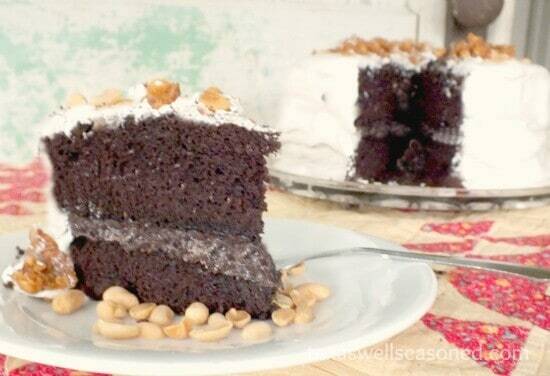 It really is an easy cake to make from scratch but here are some tips to ensure success! My yellow cake recipe gets its bright color from egg yolks. Pasture raised chickens lay eggs that tend to have an almost orange yolk and when used in this cake the color is magnificent. If your yolks aren’t a rich orangey yellow then a few drops of yellow food coloring will give you the color you want – just one or two though. Make sure your eggs and butter are at room temperature! Cream the butter and sugar thoroughly – most people stop too soon. 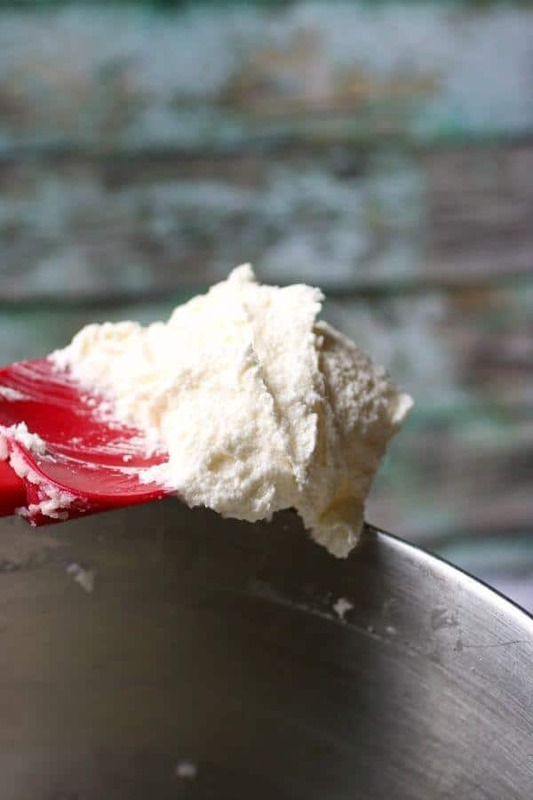 Cream it until it’s light and fluffy – and that’s going to take around 3 to 4 minutes. Use the vanilla-butternut flavoring – it adds a delicious flavor! Grease and flour your cake pans, cut a piece of parchment to fit in the bottoms, and grease and flour the parchment. This will keep the cakes from sticking. Smooth the cake batter in the pans making it a little higher on the edges than in the middle – this keeps the layers nice and flat. 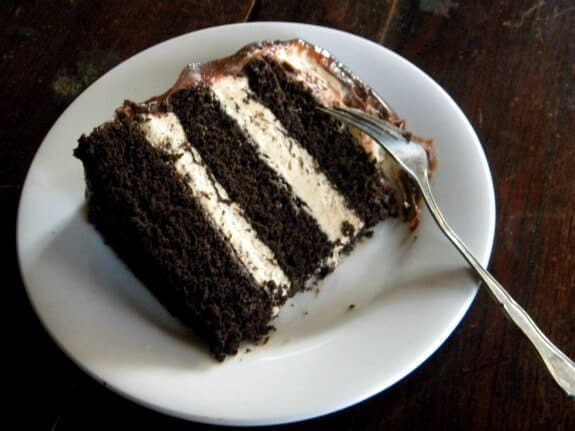 You can freeze the cake layers unfrosted for up to 3 months. This is what butter looks like when it’s properly creamed for this yellow cake recipe. This vanilla butter nut flavoring is just so homemade tasting! I use it right along with my vanilla. Give it a try – I think you’ll like it. You can make this yellow cake in a 13×9 inch pan if you like. The baking time should be about the same. You can make cupcakes out of it, too. One flavor variation that I really like is simply to add about a tablespoon of orange zest to the batter. It gives it a delicate, dreamy orange flavor. The Irish Cream Whipped Frosting would be amazing with this yellow cake as well. I am telling you, try this once and you’ll ever wan to use a boxed mix again! If you like this recipe please give it 5 stars. 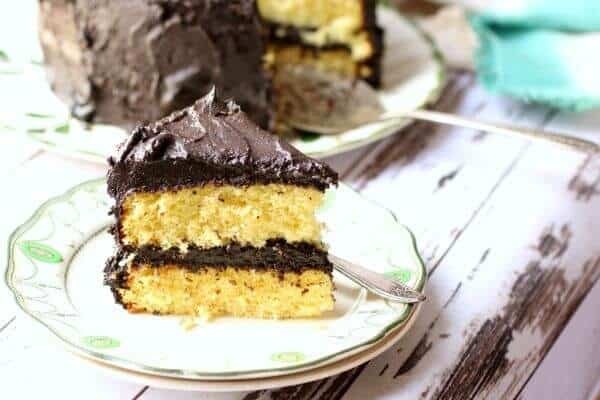 A classic yellow cake recipe with a bittersweet whipped chocolate ganache - this cake is perfect for any occasion from birthdays to family dinners. Beat in the eggs one at a time and then stir in the vanilla. Beat in the flour mixture alternately with the buttermilk, mixing just until incorporated. Bake in the preheated oven for 25-30 minutes, or until a toothpick inserted into the center of the cake comes out clean. Melt chocolate and butter in the microwave, or in the top of a double boiler. In a large bowl, combine confectioners' sugar, vanilla and 1/2 cup of the cream. 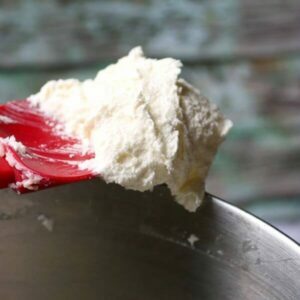 Add remaining cream, a little at a time, whipping until desired consistency is achieved. Let stand until spreadable . Frosting will thicken as it cools. Everyons needs a good yellow cake recipe in their files. Thank you. Can you double the recipe for a bundt cake? 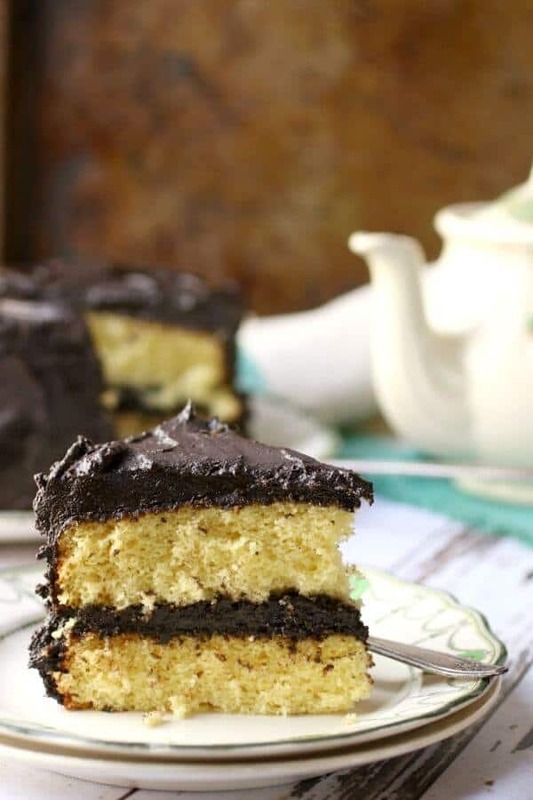 Yellow cake with chocolaty frosting is one of my favorite dessert combinations. This looks amazing! What a wonderful memory, Marye. 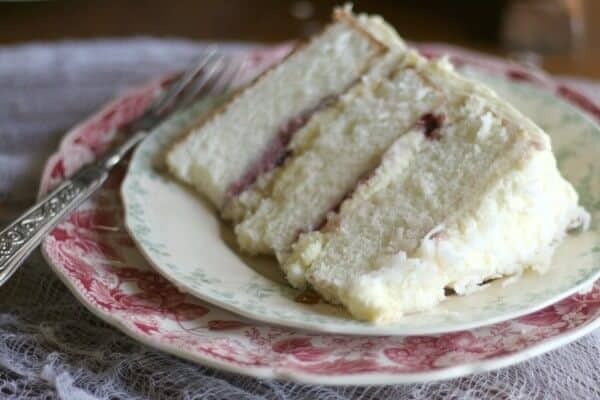 I do love a good, moist yellow cake too and this recipe sounds like a keeper. Thanks for sharing it with us! That cake looks so tender and good. 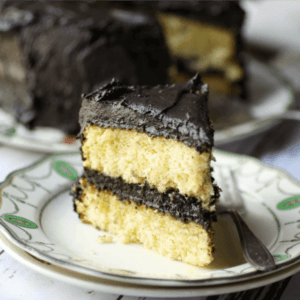 You cannot beat a classic yellow cake and chocolate frosting combination! I love a bittersweet chocolate frosting. I often find frosting too sweet. Yours sounds perfect. You can’t go wrong with a classic! This looks fabulous! What a sweet story!! And bittersweet chocolate frosting?? I”m totally sold!! Bittersweet is my all time favorite. I have to admit I haven’t made cake in ages (even though my daughter has asked for it…) You have me totally inspired! This should be your first! You are 100% correct – Would you believe that I don’t have a good, simple yellow cake in my repertoire? Now, I do! Pinned and Stumbled, too! 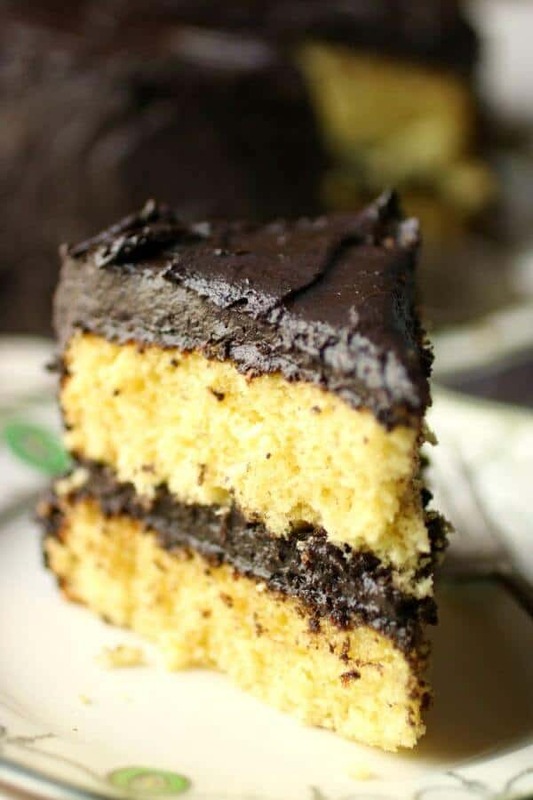 Yellow cake with chocolate frosting is my favorite cake combination. This is a must try. I love this recipe, and return to it time and time again….